Do you like watching birds? When kids are out of school, it is perfect time to hit the trail, walk in the woods, and watch birds. I have found a wonderful app that will help you on birds: Audubon Birds – A Field Guide to North American Birds. Audubon Birds is an encyclopedia on birds. The Audubon Institute has been working on ecosystems, with focus on birds and other wildlife, for decades. They made field guides that help people identify plants and animals. Now these field guides moved from paper to mobile devices. Audubon Bird is one of them. Rich data with audio and pictures: as of today, the app has 819 birds. For each bird, you will see a brief introduction and several pictures that include male, female, seasonal variations, and nests. You will be able to hear the bird songs at different settings. Journal: you can take a picture of the bird you find within the app. You can then add the picture to your personal life list. This can become your personal bird database. This is a great app to get your children out of your house. When walking on a trial with this app, kids are not only enjoying the nature, but also learning about the nature and the birds. If it is $19.99. With the amount of the information in the app, this app becomes a good deal! It works on iPhone, iPod, and iPAD. There is also a version for Android. Thanks for this excellent blog. I enjoyed checking it out and have referred my daughter to the site. She has an almost two-year-old and is an elementary school teacher and librarian so will be interested in it. I’m also going to check out this app for birds. Thank you for visiting and sharing the site with your daughter. Hope you enjoy the app. It is one of the best. Glad to learn of this app!! Will look into it more, may be handy to have access to while hiking. I like this app, especially the search feature that let you search by bird size and color. So fun to find your blog! Great resource! Keep it up! Come back for more app recommendations! 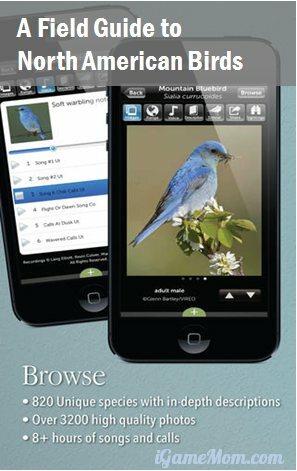 Have you also seen the Peterson Birds app? It’s on sale right now for 99¢ (reg. $14.99). It includes Roger Tory Peterson’s inimitable illustrations, playable bird songs, maps, nest photos and much more. In fact, there’s information from eight Peterson Field Guide books in the app. This sounds like a great app! Thanks for the info! I am downloading this today- thanks for the tip.